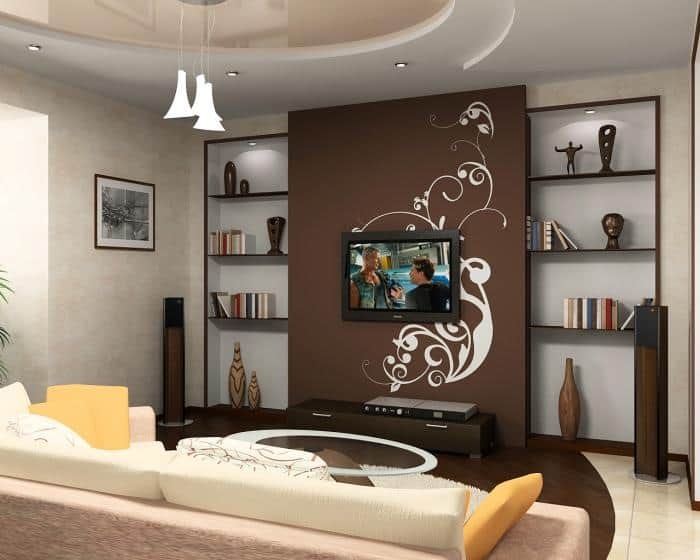 The living room is the central room in every home and apartment. 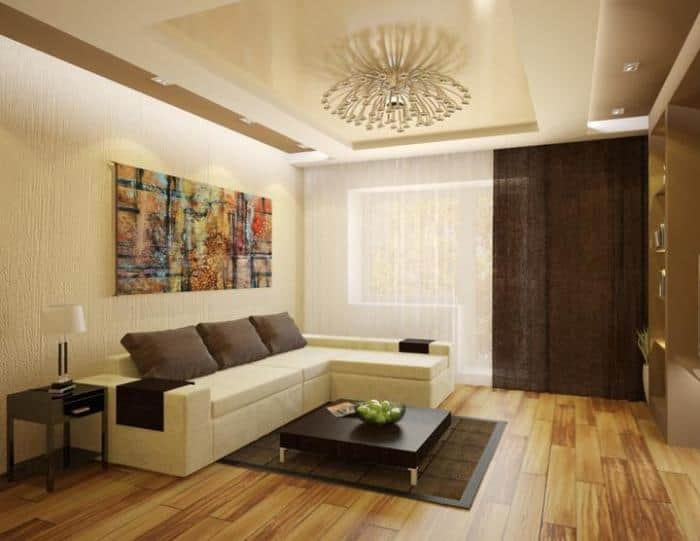 The design of the living room tells a lot about the homeowner. Just through observing it, one can easily judge the nature, temperament, and social status of the owner. Homeowners are often conflicted on how to make the living room interior bright, cozy and outstanding all at the same time. 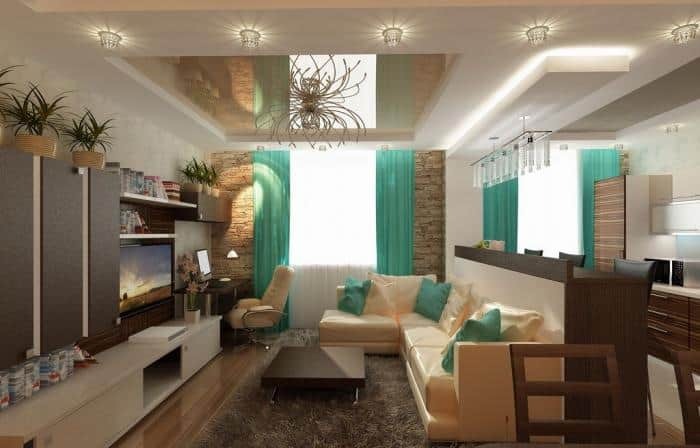 This article attempts to solve this problem by informing you about various living room design tricks and techniques, as well as showing you some interesting photos of amazing living rooms! 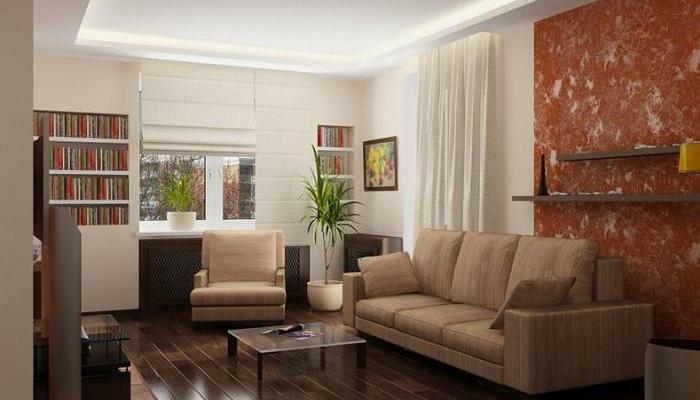 The homeowner should also strive to make the living room comfortable not just for themselves but also for guests. 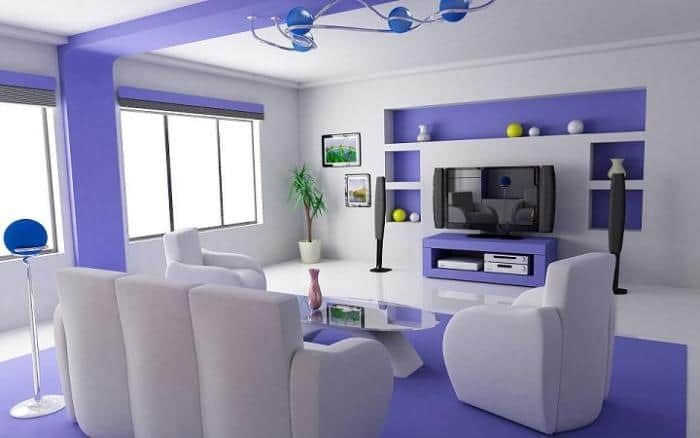 In this case, the center does not refer to the middle of the room, but the area around which the furniture is arranged. 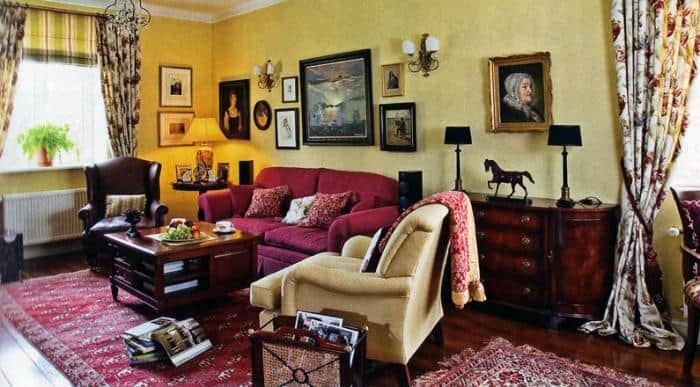 Designers advise abandoning the usual placement of sofas and armchairs around the perimeter of the room because this arrangement eats up too much space. 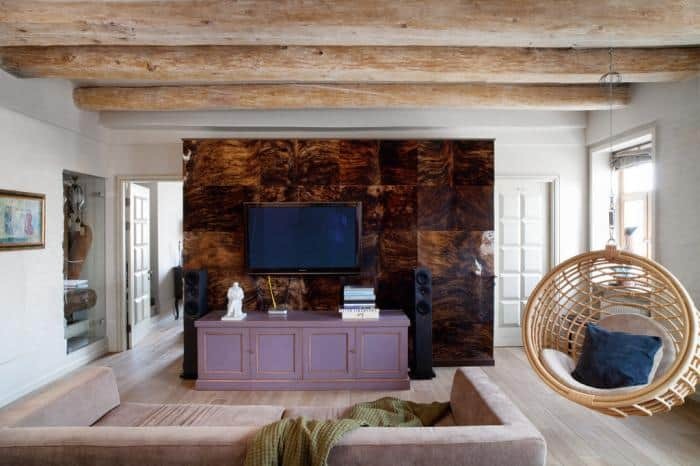 Whereas it is more traditionally appropriate to install furniture around the semantic center, which can act as a fireplace or TV, if you are a fan of classical designs, and you think that the TV in a similar setting does not look good enough, seek the help of an original wooden frame. 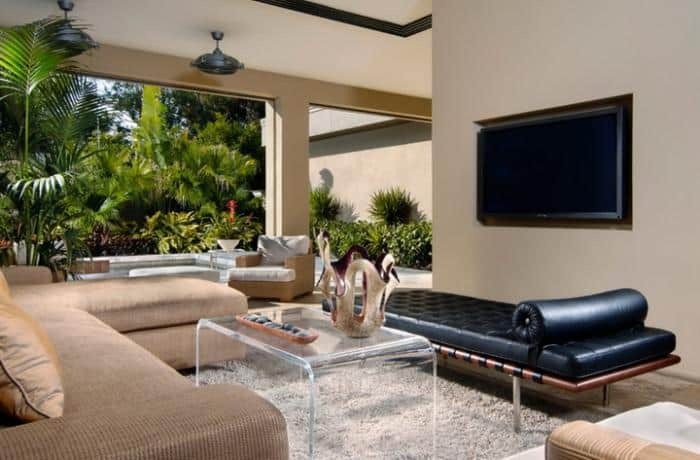 Lately, coffee table-transformers have been gaining praise from designers. These transformers can be unfolded into a coffee table or folded to make space. 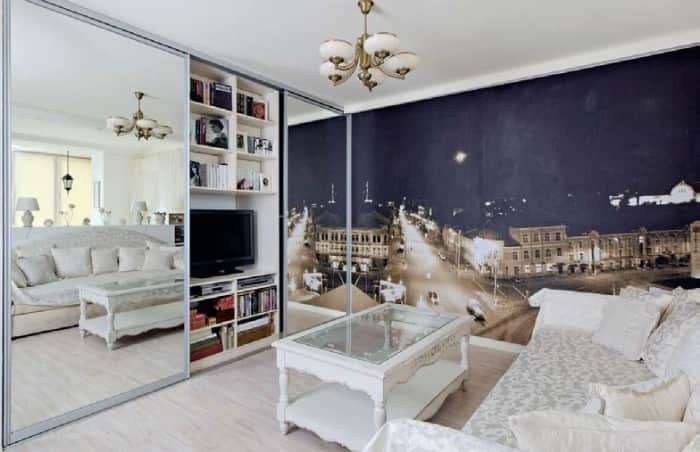 Soviet times gave us a wonderful invention called a furniture wall. While most people consider it a relic passed with time, the wall is still relevant and designers even advocate for it, thanks largely to its functionality. For those who consider themselves opponents of cumbersome furniture, you can use different modules to create varying combinations. 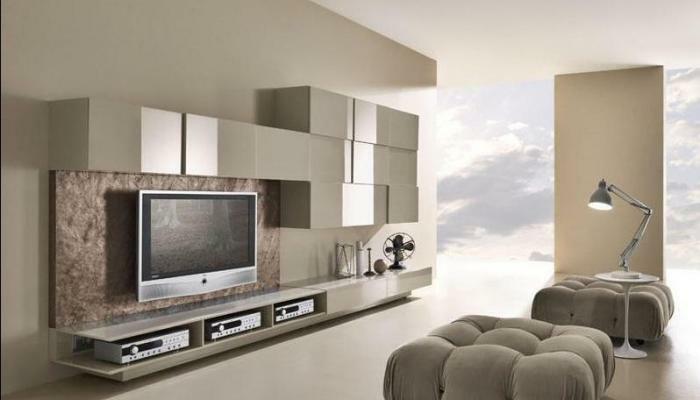 Earlier, the TV stand was an integral part of any living room. 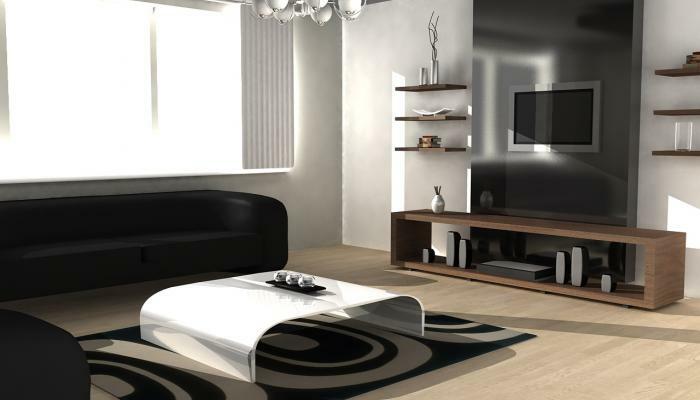 However, design norms have changed and having a TV in the living room is no longer necessary. 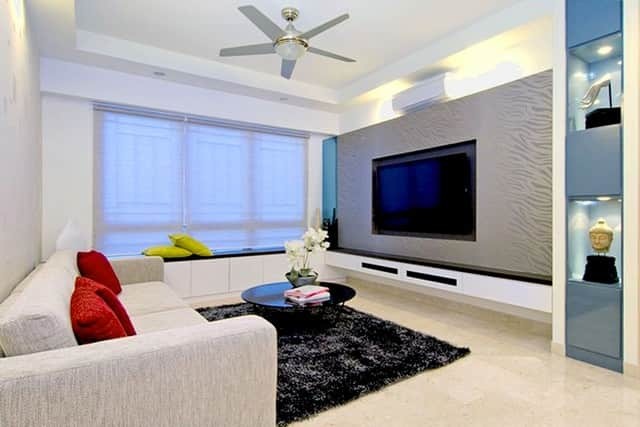 If you insist on having anyway, designers recommend hanging the TV on the wall to help save space. 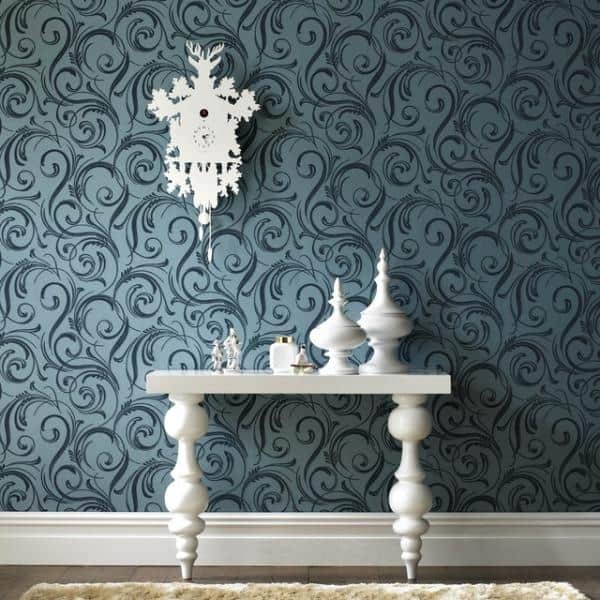 The main rule to remember when choosing wallpapers for a living room is that the lower the ceiling and the smaller the room, the lighter the tone of the wallpaper, and vice versa. 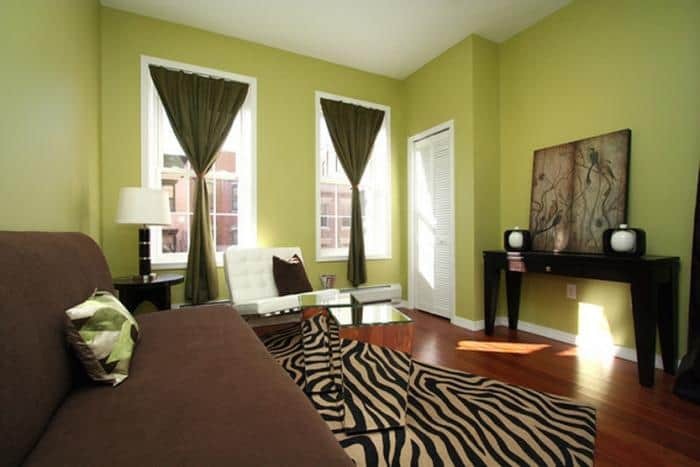 In a large room with high ceilings, saturated wall colors should prevail. 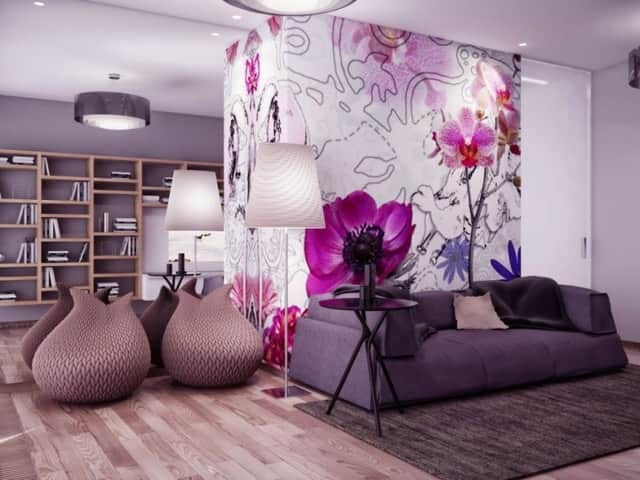 In small living rooms, the wallpaper with a small pattern, ornament or geometric figures, as well as with a vertical strip will look good: they will visually expand the space. 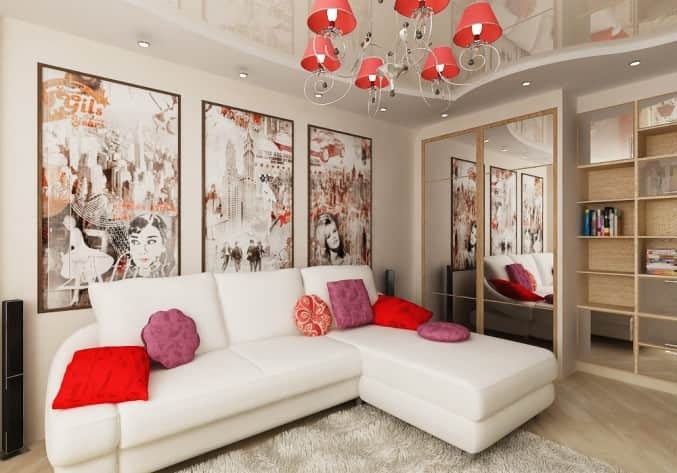 Large drawings are best left for large and spacious living rooms. Horizontal stripes on the walls have the capability of adjusting the height of the ceiling and making the room more mundane. For the living room, designers recommend choosing bright juicy shades that will charge you and your guests with energy and give you strength. 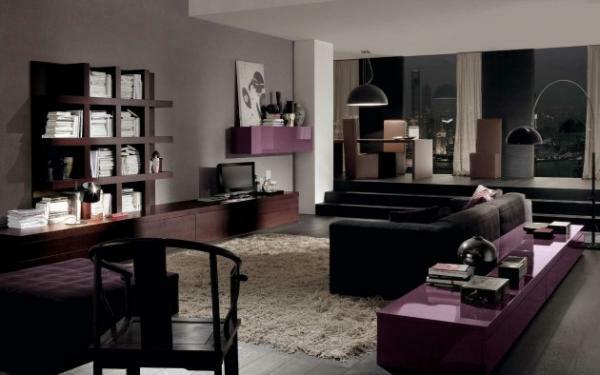 Burgundy, blue and purple relieve stress and boost the mood, according to science, which is a perfect reason to incorporate these colors in interior designs. 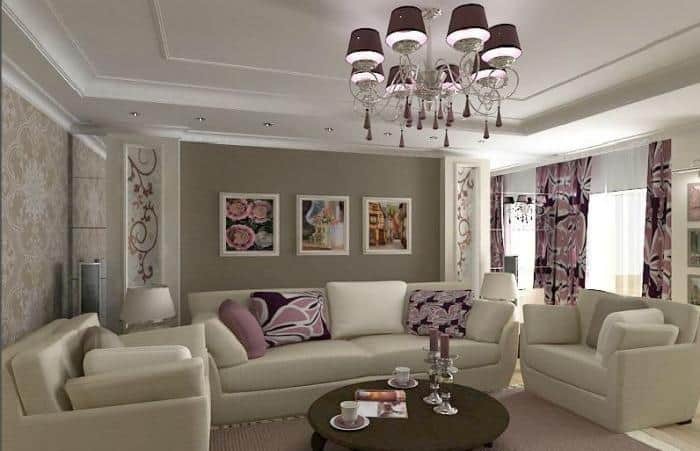 Tip: Choose curtains in your room depending on the style of the interior. 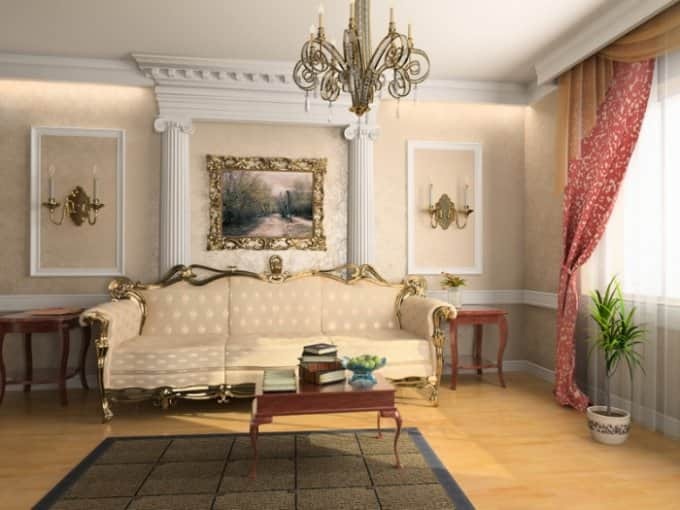 In a classical living room, you can use either light or dark curtains, with embroidered painting, ornamentation or embossing. Classic curtains are made, as a rule, in the floor and the entire width of the wall. They can also be supplemented with refined lambrequin, fringe or picks on the edge. For a high-tech, modern or minimalist living room, you need to pick curtains that are simple and concise: roller or Roman curtains or blinds. 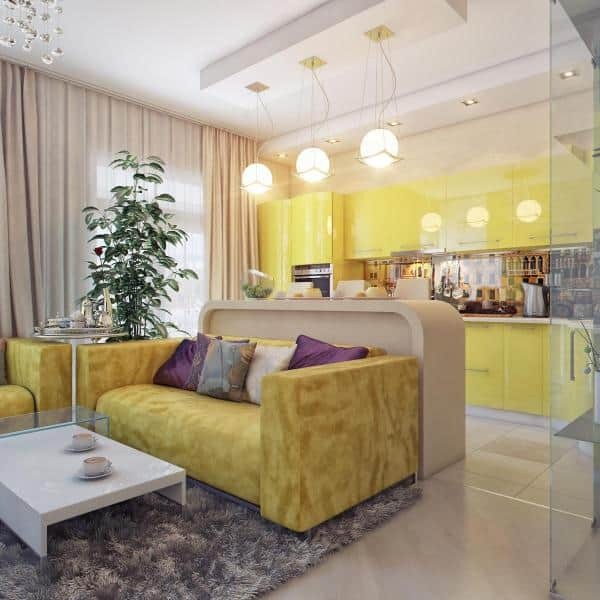 In hi-tech interiors, the shade of curtains is often chosen to coordinate with the colors of wallpaper or decor elements such as bright pillows, shelves. If you want to soften rather than emphasize the interior and make it more comfortable, go with light and transparent curtains. 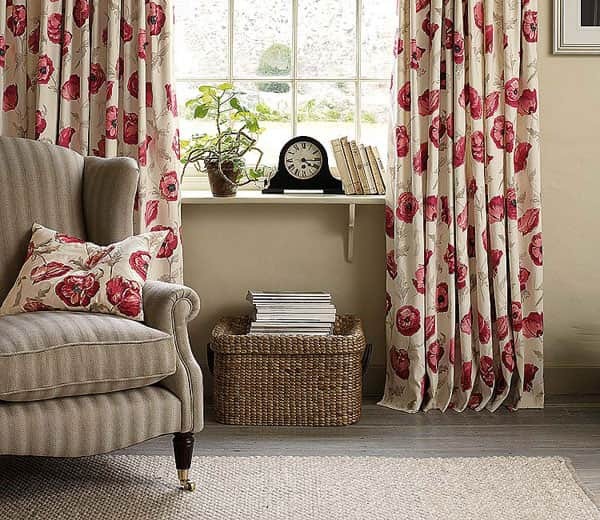 In the country’s living room, cotton curtains with an unpretentious floral pattern will look great. Buy a fabric with a stock to also use it in the manufacture of other textile elements: pillows, table cloth, seats. 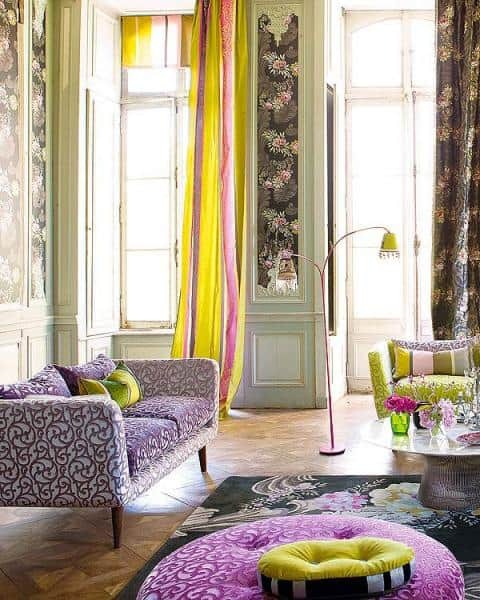 A uniform textile design will help to create the necessary style in the living room. Under the African or ethno-style, Japanese curtains or blinds, reminiscent of natural materials, such as bamboo or a mat, are best suited. 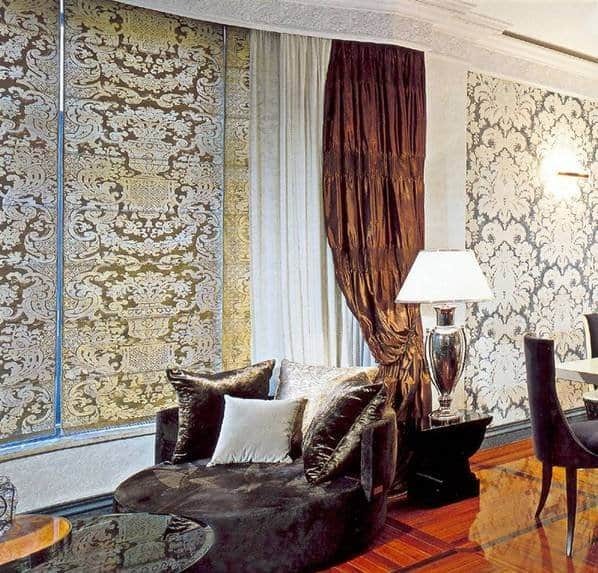 The standard curtains in the floor decorated with luxurious ornaments will also look great here. Pay attention to the combination of colors: cold shades and warm ones are not recommended for use in the same interior.Choose 2-3 basic colors, contrasting, but in one key. 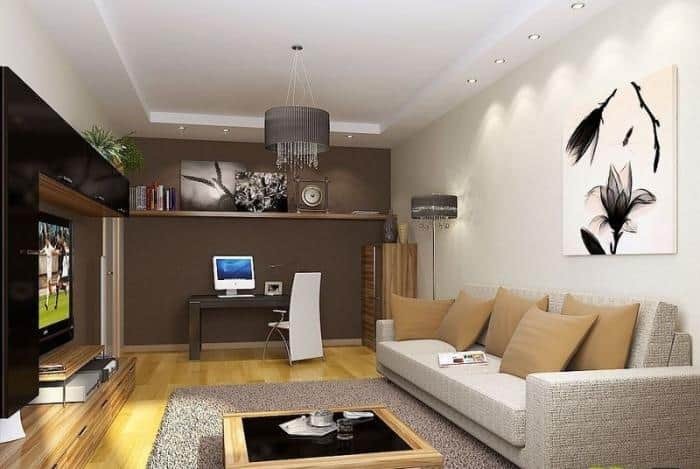 Every living room interior should have a highlight, a kind of connecting element that will give the room a complete look. Such an ornamental element can perhaps be an original painting. For classical interiors, various landscape canvases and still-lifes are suitable, especially if they come in shades that blend in with the overall color scheme. If you want to complement high-tech, loft or avant-garde living room interiors, then unobtrusive abstractions do just fine. Pictures in frames with the same color scheme as the living room are also a great yet simple décor choice for living room interiors. If you decide to order a similar decor element, make sure the lines are in harmony with the shapes of furniture and fixtures. 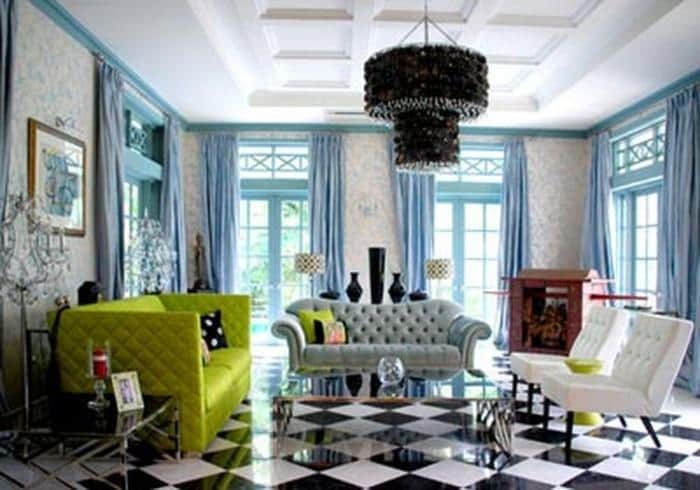 In some unique cases, décor comes in form of unusual floor coverings, which infuse originality into the interior design. 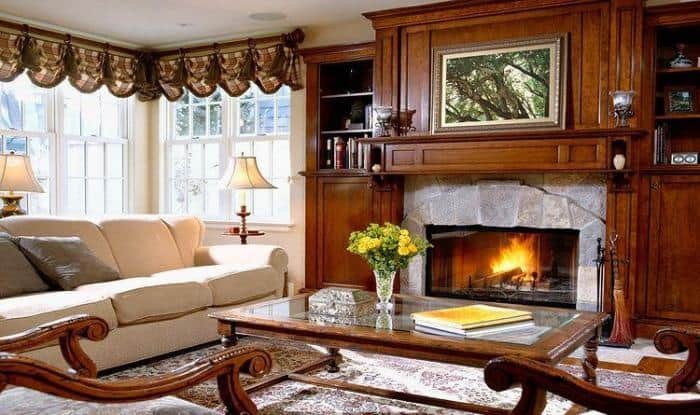 The fireplace is a beautiful decoration for any living room style. It radically changes the atmosphere and creates a warm and cozy vibe. 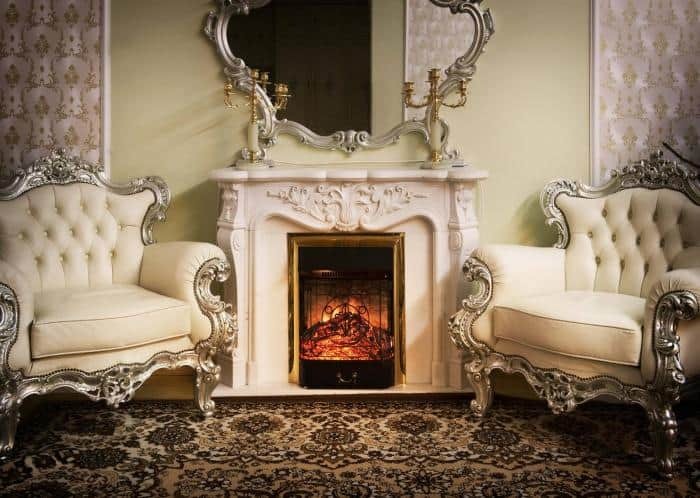 The ability to install a real fireplace, unfortunately, is only available to detached house owners since to install one, you need a large living room area (at least 20 square meters), coupled with heavy and durable floors. Fortunately for city residents, there is now the option of electric fireplaces, which can easily be installed in apartments. 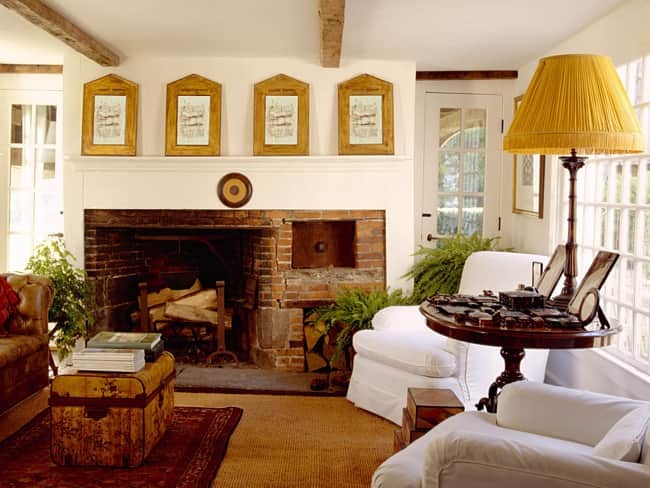 In addition to its originality and beauty, such fireplaces are good because they warm the room well. 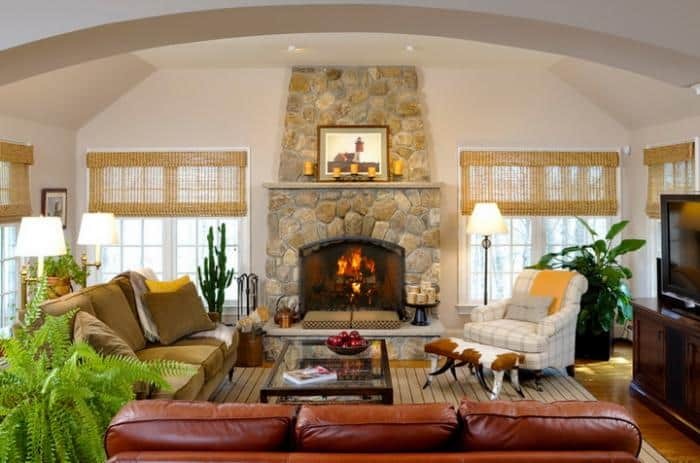 The fireplace, of course, is best combined with a classic interior, but other combinations can also work. 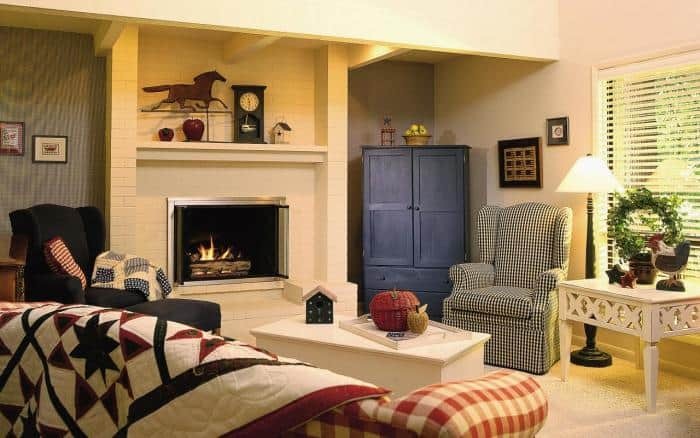 However, it is important to also select a fireplace finish, that can fit seamlessly into the existing living room design. This style will forever be popular. 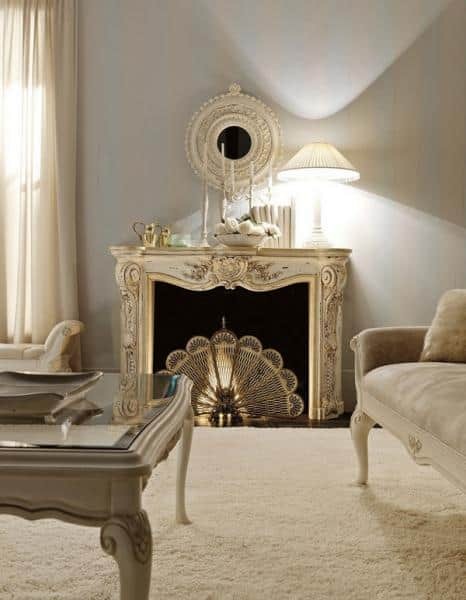 The living room, executed in the spirit of classics, always looks rich and luxurious. The living room is an ideal place to create a classic interior, because it has the most light and the maximum amount of free space. 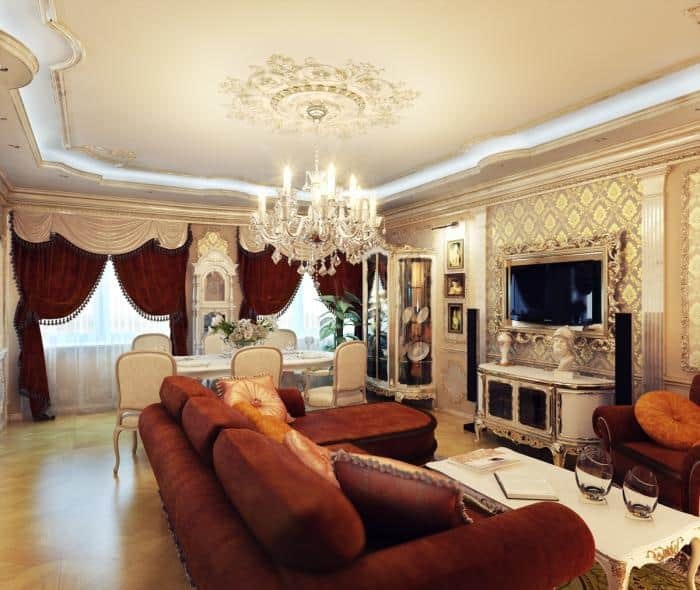 The living room in the classical style will also skillfully emphasize the wealth and exquisite taste of the owners. This style also involves the use of clear geometric shapes and beautiful ornate ornaments. High-tech interiors are strictly organized, with every item properly fitted and organized in its place. 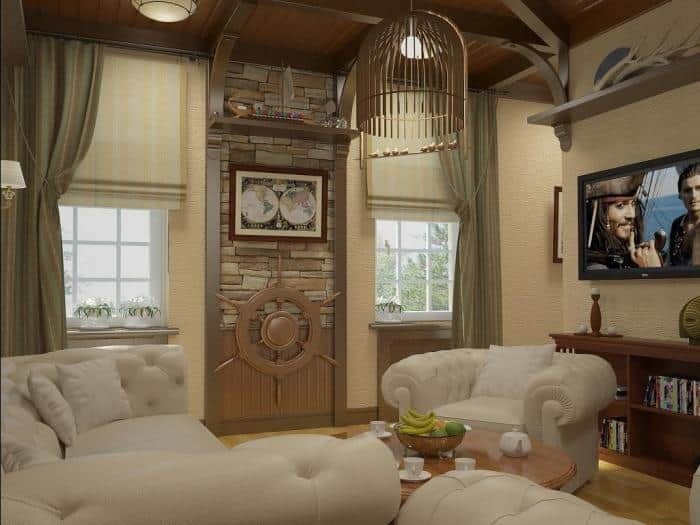 In such a living room there is no place for bright and colorful colors nor waves and bends. Everything is strictly monochrome. 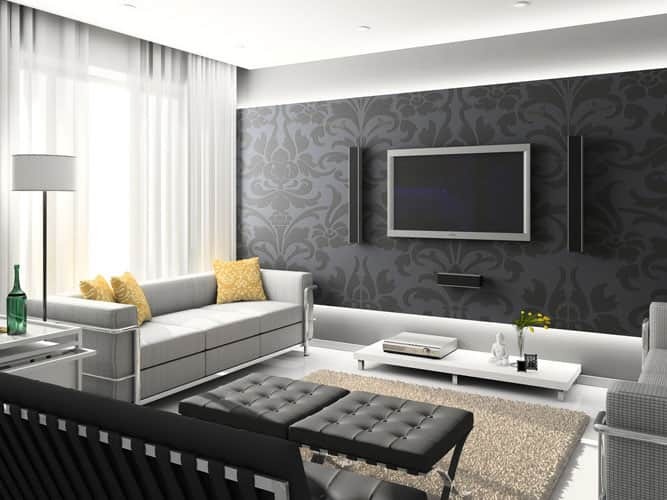 If you do not want a gray or black and white living room, you can try creating an eclectic interior by adding hi-tech elements. 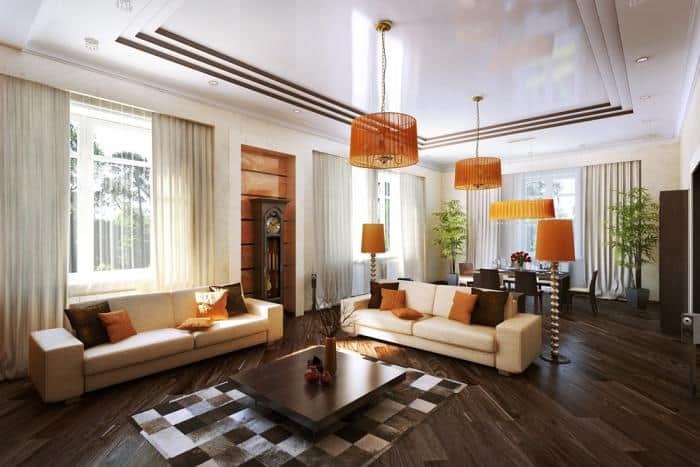 This particular room design is decorated in high-tech style with natural (ceramic tiles, frosted glass, foil, wood, granite) or synthetic (plastic) high-tech materials. 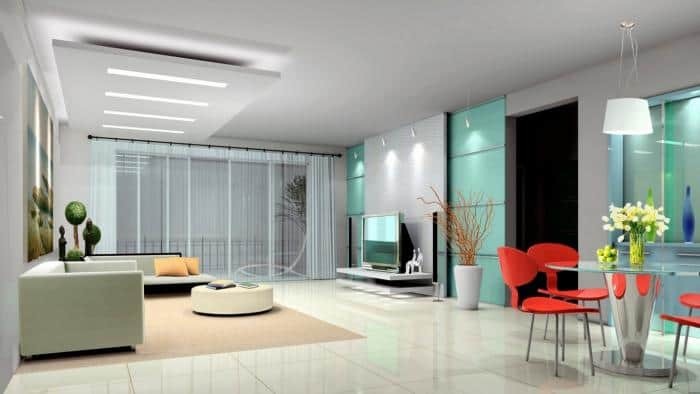 There is always plenty of light in high-tech living rooms! You can break out and experiment with trendy lamps such as halogen lamps or LEDs. The modern lounge allows you to incorporate a rich variety of technological innovations in the interior, without interfering with the style. The center of such a room, as a rule, becomes a TV or an audio installation point. Most pieces of modern furniture are made of plastic, with which you can make chairs, shelves, sofas of various fancy shapes. In addition to the form in modernity, great importance is attached to color. Modern is well combined with other interior styles: decorative inserts from other styles will look organically and interestingly. 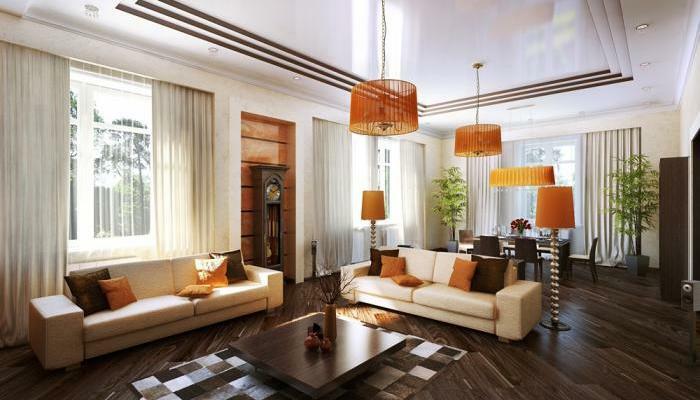 Among other things, the living room in the Art Nouveau style will be unpretentious and easy to clean. 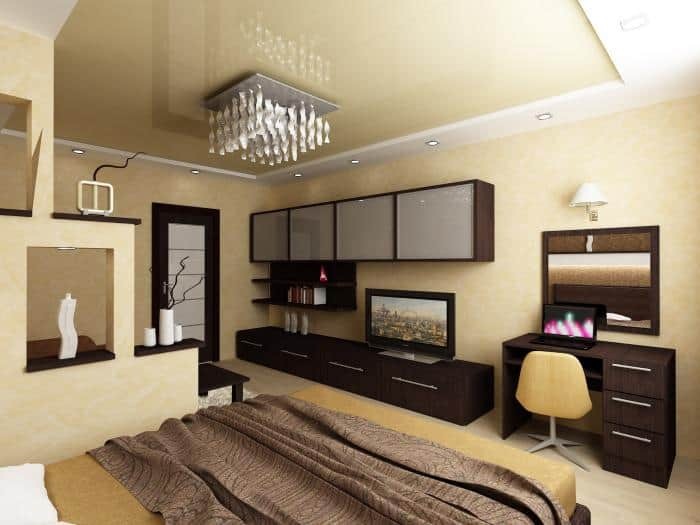 The loft-room design works best in a room with large windows and high ceilings. The room itself, in its decoration, resembles an attic or storage room with brick walls or wallpaper, simulating brickwork, a tree or rough plaster. Loft ceilings are often decorated with metal beams, accompanied with elements of steel or glass. 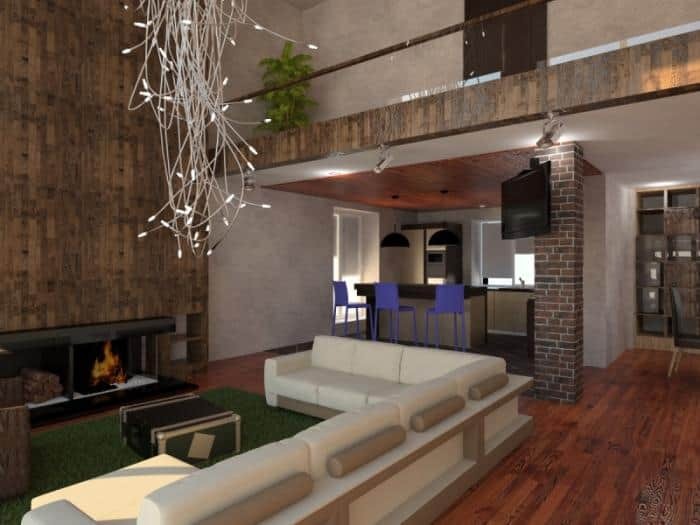 Designing walls and the ceiling with natural wood is also a win for loft interiors. 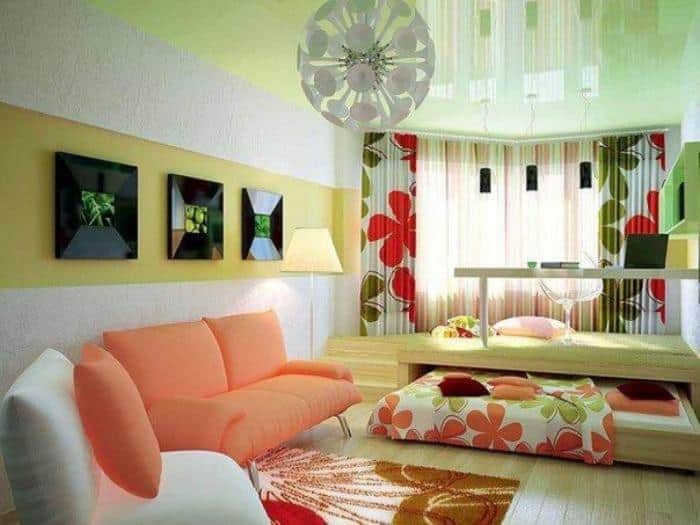 To visually increase the space of the room, use light colors for the walls. In addition, it is important to use as little furniture as possible. In the living room, it is better not to use cumbersome sofas and armchairs, but to give preference to miniature soft models. 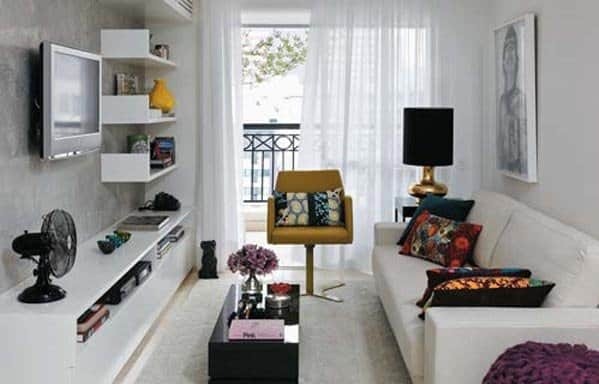 To save space, try placing the sofa not as usual along the wall, but near the window. 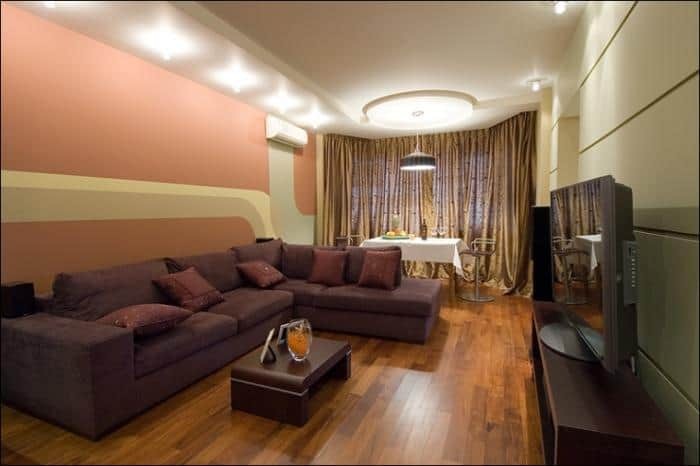 A good solution for a small living room is a sofa-transformer, which will serve as a spacious bed at night, and turn into a neat sitting during the day. 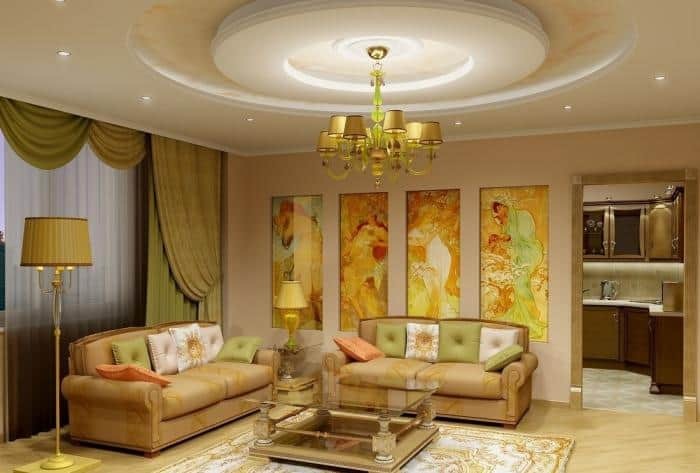 Forget about multilevel gypsum plasterboard ceilings or huge chandeliers. If you want good lighting, it’s better to hang wall lights or put a floor lamp. 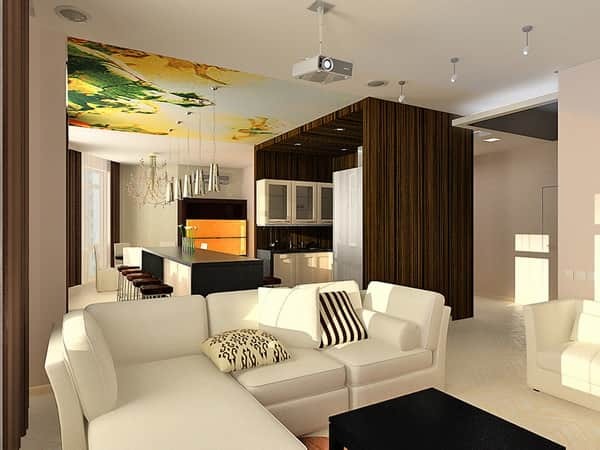 A detached house, unlike an apartment, offers a great opportunity to try out all your design fantasies! 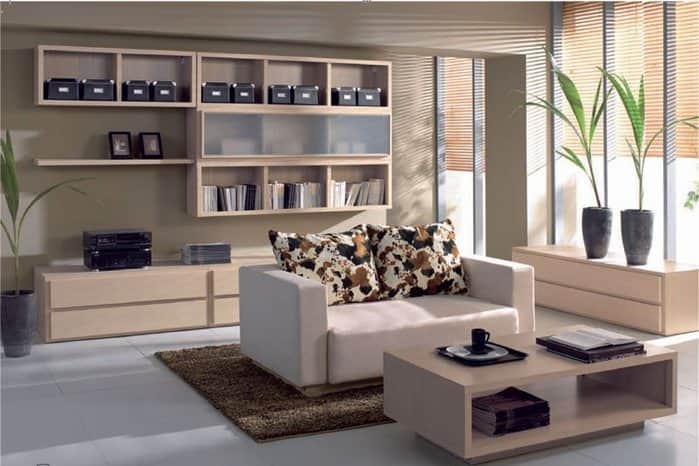 Here, neither space nor planning limits you, and you can safely decorate your living room in any style that you want! That all interior objects in the living room looked harmonious, the ratio of the crowded area to free space should be equal to one. 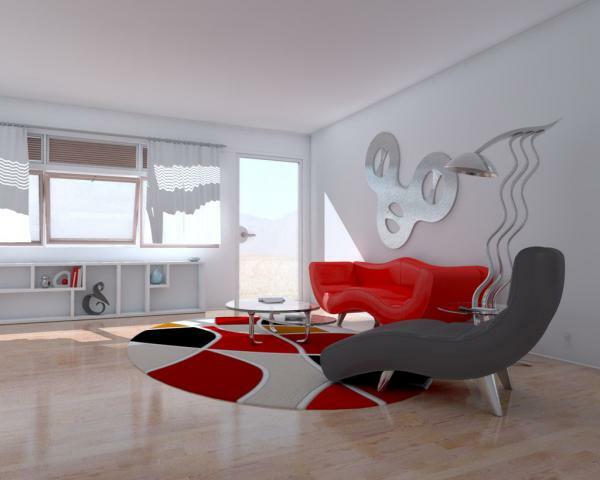 In the interior of the living room must be present so-called semantic center, which will attract everyone’s attention. It can be, for example, a fireplace or a home theater. Necessarily, simply vital in the living room is the presence of a large soft sofa and armchairs to it! 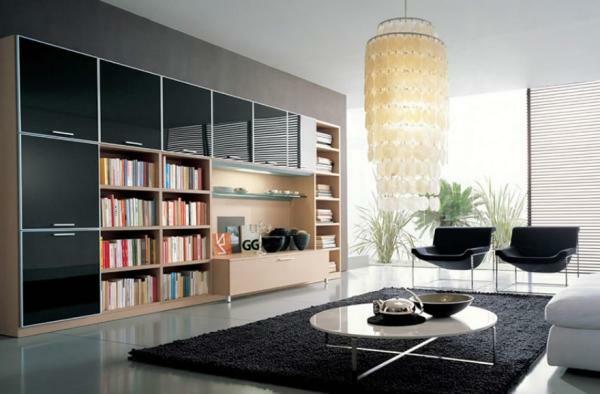 Choose furniture depending on the general style of the interior, but also take into account your personal preferences. What if you combine the living room and the kitchen? 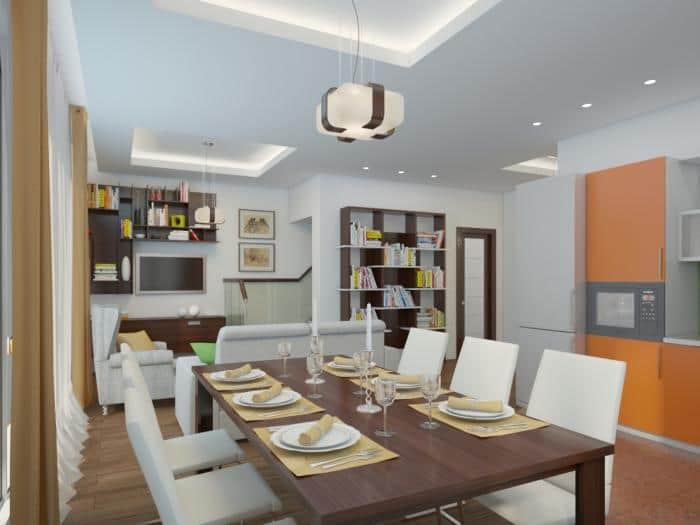 If you combine the living room and kitchen, then you will easily get a chic and spacious dining room! Every day more and more owners of two- and three-bedroom apartments are inclined to moving away from partitions and opting to merge different zones in the house. This trick makes the room visually wider, as well as more modern and appealing. It’s also more convenient to work from such a kitchen. In such a kitchen it’s also good to arrange evening gatherings with friends or noisy parties. The wall can be removed entirely or leave some part of it, but the zoning of the apartment should still be preserved, because these two rooms – the kitchen and the living room – have completely different functions. As a decor for dividing into zones, columns and arches, partitions or low screens can also be used. Different areas can be identified with the help of light: in the kitchen, the lighting should be bright, and for the living room, select lamps with a more subdued light. You can play with curtains: for example, in the kitchen it will be blinds, and for the living room, select standard curtains on the floor. It is interesting to look when the floor is made level difference, or for different zones, linoleum of contrasting colors is used. This section is particularly relevant for those who live in a studio, one-bedroom apartment or two-room apartment with a child. Due to minimal space, the room has to combine several functions at once. 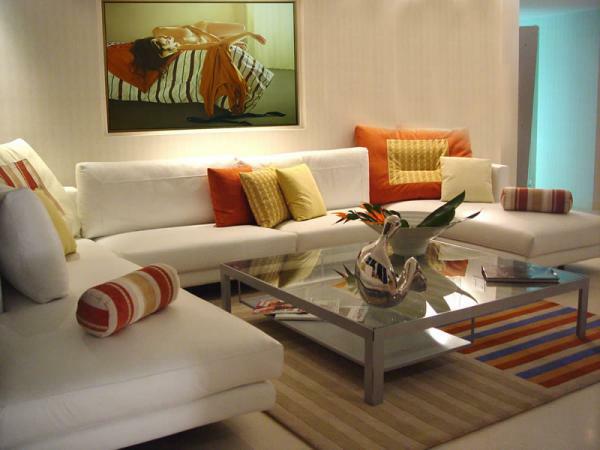 If your small living room is square-shaped, the most convenient furniture choice is a sofa bed. If the room is large enough, however, you can organize two separate full areas, one with a double bed and the other with a couch. Remember that the sleeping area should be as far from the entrance as possible, preferably at the window. 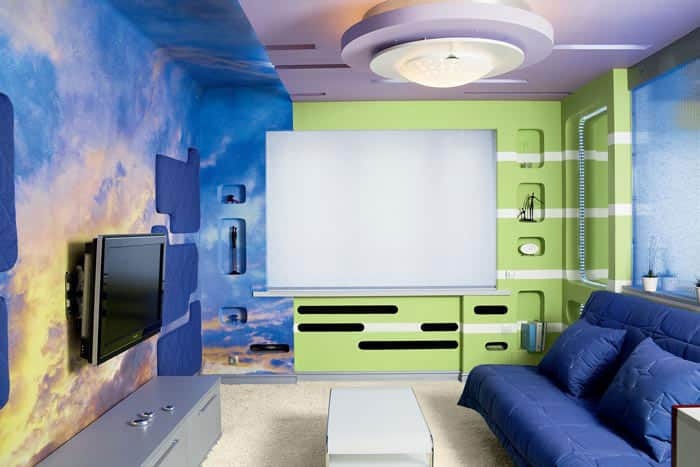 The bedroom can be hidden from prying eyes with a partition, screen, curtain, cabinet, shelving or sliding doors. 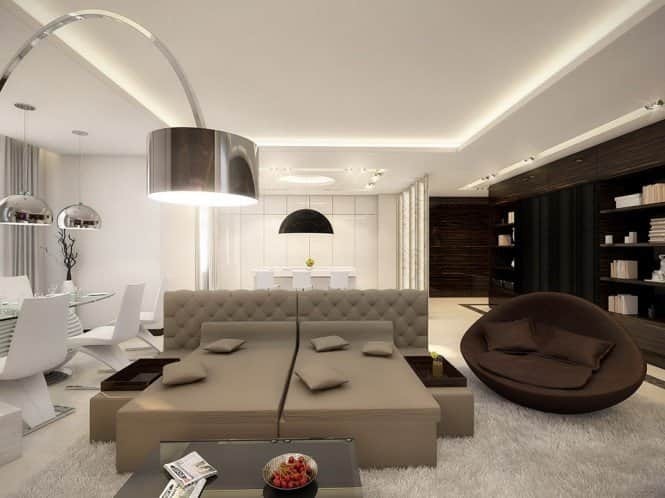 The sleeping area can also be visually highlighted using lighting, a multi-level floor or a different wall finish. Sleeping area can be separated from the living room, not only with partitions, but also due to different floor covering or the floor, wall colors, lighting. 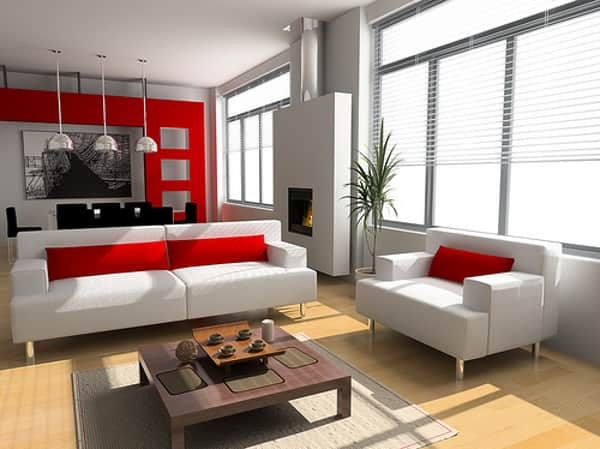 When choosing a color scheme for your living room, you need to additionally research on the implications it will have on the overall design, so you can make an informed decision. The living room option showcased in the above photo is clearly meant for the bold and daring. The designer chose to forego a traditional coffee table, and instead of a deep soft chair used a succinct and comfortable footrest. The white color scheme is diluted by a carpet with contrasting stripes, immediately catching the eye and transforming the light and modest design into a distinct and memorable one. In this living room, the designers contrasted light-colored walls with dark furniture. 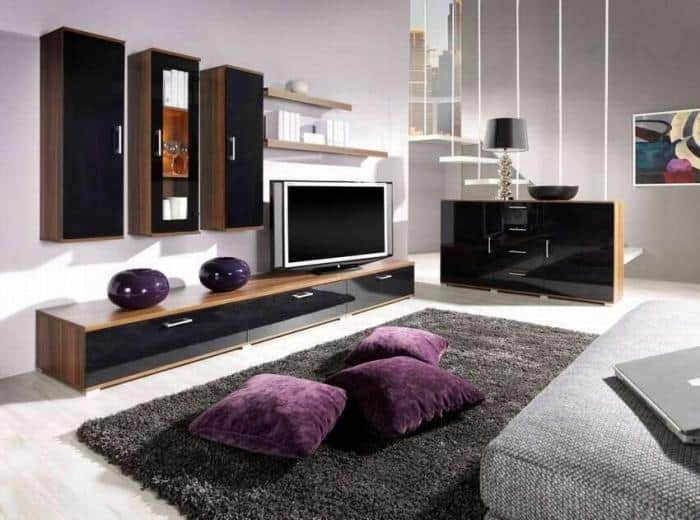 The luxury purple color emphasizes the room’s decor, black details bring add glamor and the fluffy carpet livens the room. The use of rounded lamps softens the strict straight lines created by the furniture. 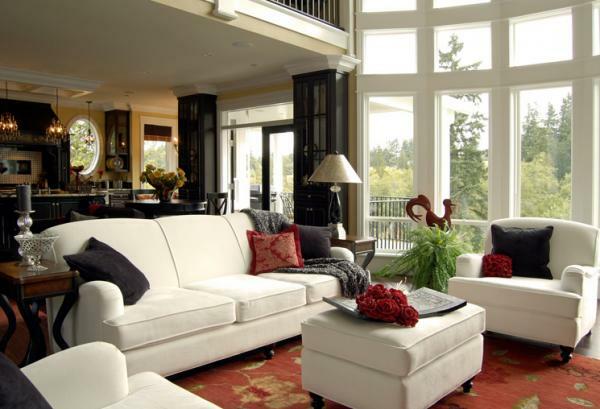 You can never go wrong with large windows and white furniture in the living room. 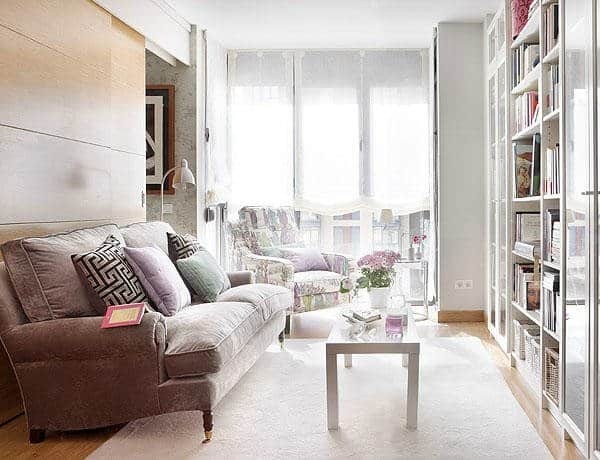 The room looks great against the background of the terracotta carpet, but the view is even better when the floor details are complemented by accessories in similar color tones (such as flowers and cushions).